Sony has two new Cyber-shot compact cameras announced. The TX55 has an internal 5x zoom lens and a 3.3″-oled touchscreen, and swallows MS Micro and micro sd/sdhc memory cards. The WX30 is a more conventional design. 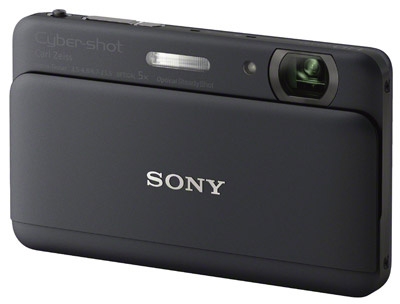 Partly due to the use of the smaller memory cards, Sony has the thickness of the Cyber-shot TX55 know and bring it back to 13.2 mm, including the slide that the opening of the internal zoom lens is covered when the camera is turned off. The lens has a 5x zoom range with a wide angle of 26mm in focal length and is optically stabilized. The TX55 is equipped with a 1/2,3″-Exmor R image sensor with 16.2 megapixels, and has a touch-sensitive 3,3″-oled-screen. The Cyber-shot WX30 uses the same Exmor R sensor as the TX55, but has an optically stabilized 5x-zoom lens, which is just out. The WX30 makes use of sd/sdhc and Memory Stick cards for storage and has a 3″lcd touch screen with 922K subpixels. Both cameras can video with a maximum resolution of 1080/50i recording, where the avchd-codec is used. Also his pictures are possible with mp4 and then a maximum resolution of 1440×1080/50i pixels. The maximum burst rate for photos is in both cameras 10fps. The TX55 will have a suggested retail price of 380 euros and is available this september, while the WX from August in the stores for a suggested retail price of 250 euros. [update 26/07/2011]: Sony notified us that the information about the water-tightness of the TX55 on his website is not right. The TX55 also has no stofafdichtingen and is also not resistant to valschade. The article is adapted.